Using VFD for motor speed regulating has many advantages. Many small power motors adopt single phase power supply. How to use VFD to control speed for single phase motors? ATO will provide the following methods. The mechanical equipment with single phase power supply usually adopts AC motor below 1.5kW. In addition, most of them employ the single phase starting capacitance motor while the other few amount equipments adopt the single phase running capacitance motor. 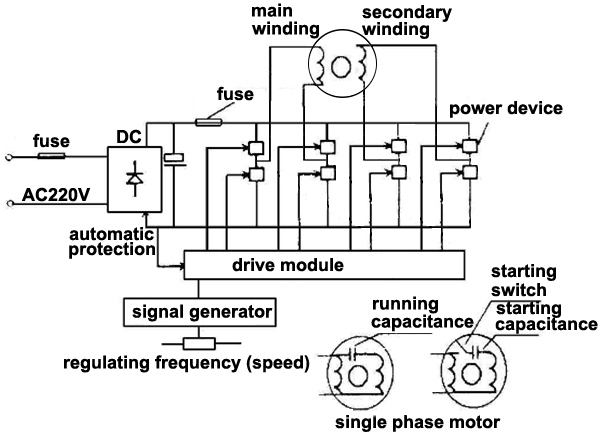 When the single phase starting capacitance motor is used, in starting, the centrifugal switch is closed and then the starting capacitance will be connected. When the motor speed reaches about 75% of the rated speed, the centrifugal switch separates. The starting torque is about 2.4 times of the rated torque. The impulse current is about 7 times of the rated current. With such method, the impulse current is big, mechanical shock is big, starting torque is big and the speed is unable to be regulated. When the single phase running capacitance motor is used, there is no centrifugal switch. The operating capacitance is connected for a long period. This motor has small starting torque, which is usually 3/5 of the rated torque. Therefore, it is only suitable for the loads with soft characteristics, such as the blower and water pump and so on. There are also some other single phase running capacitance motors, for which, increasing the running capacitance can increase the starting torque. However, the starting current is about 6 times of the rated current, and it has mechanical shock. The single phase running capacitance motor employs the voltage regulation method to change the slip ratio of the motor. It can also realize stepless speed regulating. However, such method has a bad effect. The speed can't be controlled stabilized. Its torque characteristic is also bad. Using VFD can make the single phase equipment possess good performance in stepless speed regulating. Eliminate the starting capacitance or running capacitance of the single phase motor, and eliminate the centrifugal switch, let single phase motor work as two phase motor. The main winding and secondary winding of the motor are conducted the speed regulating control through the VFD. In the single phase motor, the secondary winding phase advance 90° than the main winding, thus making the motor to form a round rotating flied and having great motor characteristics. 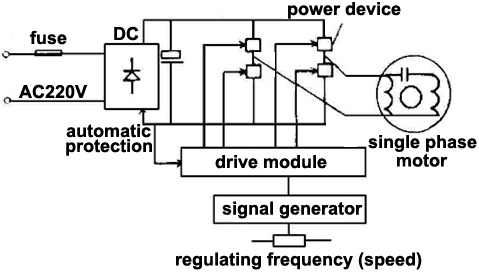 The VFD inverts the DC high voltage through eight power devices. Four power devices are inverted into variable frequency AC to drive the main winding. The other four power devices are inverted into phase advance 90° AC to drive the secondary winding. The overall frequency is controlled by the preamp circuit synchronously (as shown below). Such VFD has good performance. It can make the two phase motor to revolve under the round field accurately. The starting and running torque of the motor is decided by the sustained voltage of the main winding and secondary winding, and VFD can set these voltages. The VFD can enable the two phase motor to work under the soft starting or soft shut off without impact, thus achieving good characteristics of starting torque. The disadvantage is that the cost of the VFD is high for adopting eight power devices. The single phase motor can't be simply connected with the VFD. Because the centrifugal switch can't conduct stepless speed regulation, it must be eliminated. Starting and running capacitance can't sustain the high-frequency carrier of the VFD. Under high frequency, the capacitance is easy to become heated or broken. The running capacitance in the single phase motor is equipped for the secondary winding to be advanced 90° of the main winding. Such a configuration is conducted under the power frequency of 50Hz. The capacity of the capacitance is related to the power frequency. Therefore, the running capacitance can't ensure the requirement of the original phase shift 90° because of the change of the power frequency. We have to solve the above problems, so as to apply the single phase VFD in the single phase running capacitance motor. Applying the single phase VFD has to reduce the carrier frequency, eliminate the high-frequency carrier or harmonic wave, so as to reduce the danger caused to the running capacitance. In the single phase running capacitance motor, the running capacitance should not employ the electrolytic capacitor. Instead, the high quality fixed capacity with high frequency endurance should be adopted. In such way, the single phase VFD can be applied (as shown below). Applying the single phase VFD has a low cost. However, because of the existence of the capacitance, it can't reach the profound characteristics of the two phase motor fundamentally. However, it is economic and practical, combining its good application in the normal light load, it has practical values. In the civil occasions, the single phase power supply must be adopted. After using VFD, the motor can realize stepless speed regulation, so as to improve the performance. It is not only beneficial for the working quality, but also for energy saving. Various VFDs with single phase 220V power supply has a lower cost than the VFD with three phase 380V, so it is relatively economic. Can a 3 phase motor run on single phase? How to Select a Variable Frequency Drive (VFD)?